Sewing Room Ideas: Organizing for Room to Sew! Having a dedicated, organized and inspiring sewing room makes diving into a sewing or quilting project much more fun. If your dining room table holds fabric and scissors more often than dinner plates and wine glasses, it might be time to think about finding a permanent spot to sew in your home. You’ll want good light, enough space to spread out patterns while you’re cutting and plenty of storage opportunities for your fabric stash and tools. Looking at sewing room ideas on Pinterest is a good source of inspiration. While it may sound like you need to build an addition to create your ideal sewing room, never fear. Even a closet can be a good sewing space. Sharilyn of lovelydesign made the most of a small workroom by creating a sewing nook in the closet. A corner of the basement could work, too; check out this space from Ish & Chi. You could also repurpose a seldom-used room in your house, like the formal dining room, as Jen of Tatertots and Jello did. And even if you’ve had your sewing room set up for years, it’s worth it to reorganize every once in awhile (you might find really great fabric you forgot you had!). Spending 20 minutes hunting for your seam ripper is a surefire way to kill your sewing mojo. My favorite part of setting up my sewing room was finding the perfect spot for all of my fabric and supplies; I wouldn’t mind if I had to organize my sewing room all over again. Here are some of my favorite sewing room organization ideas. Be sure to take a look at our other great sewing room tips, including dividing materials, tools and your space. Make the most of limited square footage and take advantage of vertical space with a pegboard. Grab a pegboard and some s-hooks from your local hardware store, mount it on the wall and hang up your tools (scissors, rotary cutters, rulers) to keep everything you need frequently at your fingertips. A thread rack will hang nicely on your pegboard and allow you to easily see your thread all at once (no more buying duplicate spools!). A magnetic knife rack is also a great sewing room organizer. Mount it to the wall next to your pegboard and pop your sewing feet and seam ripper on there. You can also try this tip for creating needle storage boxes over at the Colette Patterns blog. Add some magnets to the back and they’ll stick to the knife rack nicely. Going Home to Roost has an easy DIY for making your knife rack look less utilitarian. Even if you have square footage to spare, storing your most used items out in the open makes them easy to put back and helps keep your work surface clear. One of my favorite sewing room organization tips is to store notions in glass jars. Zippers, buttons and trim separated by color are pretty and functional. Keep an eye on the recycling for opportunities to upcycle your storage containers, or buy some Mason jars. Another option for odds and ends is a nail and screw organizer, like this one. Even the most well-curated fabric stash can start to feel overwhelming, and taming your fabric stash is critical for sewing room organization. Fold fabric to a uniform size and stack on shelves or in labeled bins. You can also make your own mini-bolts and create a fabric store experience in your sewing room. No space for shelves or bins? You could install a curtain rod and hang your fabric from curtain rings. If you frequently purchase fabric without knowing exactly what you’re going to make with it, use index cards to write down the quantity, fabric content and if you purchased it with a particular pattern in mind. Tuck into the fabric or punch a hole in the card and thread it through a selvedge to tie around the fabric. Organize fabric in a way that makes sense for you– by color for easy mixing and matching, by fabric content to keep your knits separate from your wovens, by designer, or even solids vs. prints. Commercial patterns are notorious for not fitting back into the envelope once they’ve been used. Instead of ending up with a lumpy envelope, why not put your pattern pieces into a 9 x 12 manilla mailing envelope instead? Cut down the front left side and bottom of the original envelope so you can see the front and back next to each other and attach with tape to the mailing envelope. This allows you store your quilting and sewing patterns horizontally in a filing cabinet however makes the most sense for you (by company, pattern number or type) and flip through them with ease. 3-ring binders outfitted with clear page protectors are another option for pattern organization. This works especially well for PDF patterns that didn’t come with a physical envelope. If you have a large pattern collection, separate by category (dresses, tops, children’s) or pattern manufacturer. Professional pattern hooks are a great organizing option if you are in the habit of transferring patterns to sturdier paper (like Swedish tracing paper or exam table paper) and have extra space for hanging them. Don’t forget to surround yourself with inspiration! You’ll want to keep track of favorite color combinations and ideas for future sewing projects. Cork tiles or a bulletin board are easy, affordable solutions. You can get more creative with a series of clipboards, like Rachel of Smile and Wave uses, or a gallery photo wire to hang inspiration without pushpins. One of my favorite ideas for sewing rooms is to bring in color inspiration by using embroidery hoops to display your most loved fabric. Create a functional, inspiring sewing room in your house (no matter how large or small) and you’ll always be ready to tackle a sewing project. If you’re looking for more organized sewing room ideas and sewing room photos, some of my favorite sewing rooms are Alicia Paulson’s of Posy Gets Cozy, Anna Maria Horner’s studio, and this whimsical space from Little Miss Momma. How do you keep your sewing room inspiring and organized? 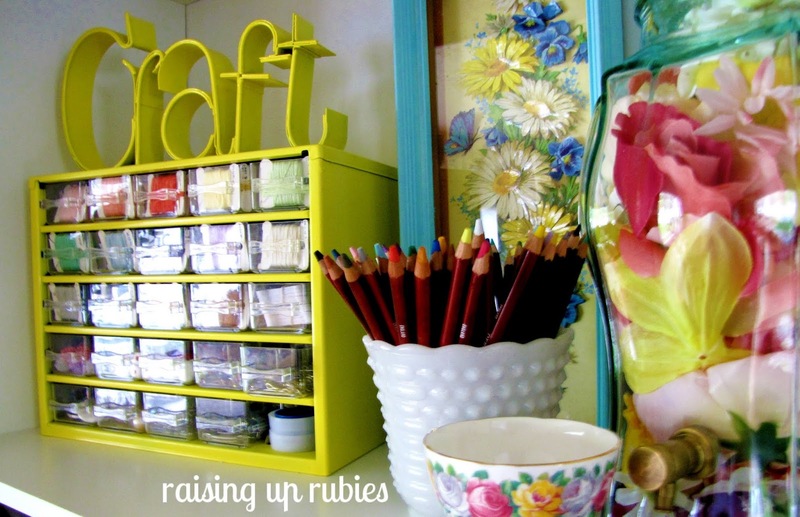 How about organizing a craft room in general, not just sewing. I spin, knit and weave, (of course I have a sewing machine too) and I struggle to organize yarn, roving, tools, looms… you get the idea! Wow – I was just wondering about that and I saw your comment. I quilt, sew apparel and childrens toys, embroider both hand and machine – which requires various machines and zillions of threads and fabrics and of course books and print outs. I am not a one project at the time person – I kind of start quilting and then go to machine embroidery . . . – I am sure you understand. So what do you do? I love to do lots of different crafts, but my main three are crochet/knitting, art journaling and sewing/quilting. I’ve struggled with organizing the studio with all this stuff going on, but it’s slowly coming together. I’m arranging my studio in zones … I have my sewing table with my sewing machine on one side and a cutting station on the other. I have a 6-drawer that fits just to my left inside the chair well that I keep my threads sorted by color. And I have a set of drawers to the left of that that keep all my notions for sewing (seam ripper, extra needles and bobbins, etc.) organized. I just bought some cubical-type shelving last month and I have 18 cubbies. The top 2 rows (6 cubicals) are for displaying cute things and for my done journals and the bottom 12 are for my yarn stuff … I got 12 fabric drawers for those spaces and have sorted my yarn by thickness, and a couple of the drawers are for notions (needles, hooks and other doodads). I’m currently working on how to store the various doodads in smaller pouches or bins inside the bigger fabric drawer so that they don’t become a jumbled mess. Then on another wall I have another table that I plan to use for my art journaling stuff. There’s a peg board above it that I used to keep the sewing notions like rulers and scissors on, but I’m in the process of finding storage for those things on the sewing table, and will hang art journaling stuff on the peg board just above the table so it’s in easy reach (I’m picturing buckets or small baskets to hold pens, pencils, paintbrushes, etc.) The upper section of the pegboard is a bit hard to reach over the table so I’m thinking it’d be a great place to hang more decorative/inspirational things. So, all that to say … try zoning your crafts a bit (even if one craft just gets a drawer or two). Even better than taping the pattern to the manilla envelope, my mentor suggested putting the envelopes in a plastic 3-ring binder sleeve. Then, she rights the pattern number on the upper right hand corner of the manilla envelope. That way it’s easier to flip through them and retrieve the one you want. I, being a master map folder, just have my patterns in a file box for now. I started using the manila envelopes decades ago. Envelopes are in sheet protectors in tabbed binders; tabs are similar to pattern catalogs’. I can flip through a category of pattern envelopes quickly, pull a sheet protector to take to the store. Sometimes the top edges of an envelope will still want to tear; wrap tape around the sides of the fold to reinforce if needed. Argh — I inadvertently used html code symbols! I’ve seriously been thinking of inventing a plastic, reuseable envelope system for store-purchased patterns. I cannot stand how they never fit in the envelopes, or if they do, they’re all fat and different from the rest. Or the envelopes tear. Or the directions tear. The patterns tear anyway for me. 😉 But someone has got to come up with an expanding, clear, envelope that closes with hook-and-loop tape or the “figure 8” string or something, anything! Go to Staples or Walmart, or someplace that sells office supplies or that has a stationary department. They have clear expandable folders there! They are big enough to put a piece of printer paper into each slot and come in many different choices of how many pockets you want. The one we bought at Staples last week has 21 pockets. In order to corral all my fabrics, my husband installed the wire shelves from closet organizer about 6′ up the walls. Then we attached a hanging rod. The shelves hold fabric bolts, supplies for headbands and assorted other suppliues I don’t use daily. My cutting tables have plenty of room under the hanging fabrics plus room for shelving cubes. I am very visual and need to see everything, so having the fabric on display makes it very easy for the type of work I do. Your ideas are very helpful.Should help many enjoy. saw horses.Table then,can rest back of sofa. I stick my patterns in gallon size freezer bags (Walmart brand). And I have also punched holes in some and stuck them in a three ring binder. I use a lateral file cabinet for my fabric. I quilt, make costumes and sew dog clothes so most of my fabric is 1yd or less. I take the hanging file folders and wrap the fabric around it then hang it in the cabinet. You can put the scraps inside the folder to keep them with the larger piece or put coordinating buttons or trim in with the fabric. You can open a drawer and see all the fabric you have. You don’t have to dig to the bottom of the stack so everything stays nice and neat. The cabinet is also metal so I have some little magnetic containers with clear lids on the side that hold buttons, trim and various other small notions.I have magazine holders on top of it to hold my quilting magazines and a thread rack so I have all the materials in one place for any project I want to make. I have been using the large size (26.8 x 27.3 cm) Heavy Duty Freezer bags made by Ziploc for a few years now. I especially needed something to hold the pattern pieces I copied from QuikSew patterns as I ended up with many extra pattern pieces for various sizes, as well, after taking some bra and swimsuit classes, I had developed my own patterns without envelopes. Some of those tiny pieces can easily be lost. The bags stack well, either vertically or horizontally but can sometimes slip out, a tiny bit frustrating. There is also a space on the bag for displaying the pattern number and I put the envelope in so that the picture is visible on the clear side of the bag. I take a picture of a finished item for my own patterns to display in the bag. I had to set up a spreadsheet on my computer after buying 2 duplicate patterns so now I can check to see if I already have the pattern before I buy it again. Some great ideas here. Thank you guys!